There has been a great deal of activity in the SKA world on the Communications and Outreach front since the last issue of the SKA eNews. In this section, we aim to provide a helicopter view of the most relevant SKA-related outreach activities undertaken the around the world. Note that a more exhaustive and detailed list of comms/outreach activities driven by SKA Organisation (SKAO) Comms team is available every month in the SKAO Monthly bulletin. Supported by the Communications/Outreach colleagues from the SKA Member countries, the SKAO Comms team is in charge of delivering the ambitious overarching Communications Strategy approved by the SKA Board in early 2014. Since the last issue of eNews, the SKAO Comms team grew up and now consists of 4 people. Mathieu Isidro joined the team as Deputy Manager in January 2014. Joe Diamond took up duty as Outreach Assistant at the end of March 2015 for a 6 month-period and Gao (Angela) Qiyang started a 6-month secondment early June, focusing her efforts on developing an SKA Chinese outreach programme and specific initiatives in collaboration with the SKAO Comms team. 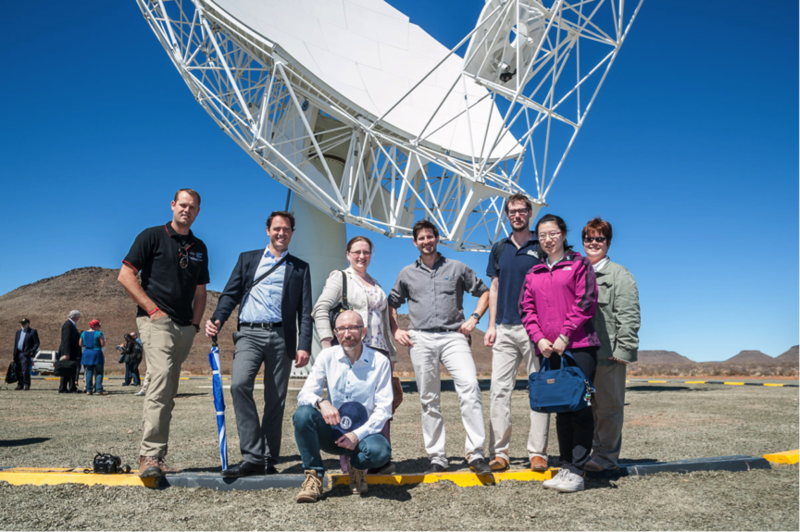 A few members (and former members) of the SKA Communications and Outreach Network in front of a MeerKAT antenna. Photo taken in March 2014. Members of the SKAO Comms team are: William Garnier (second from the left), Mathieu Isidro (fourth from the left), Gao/Angela Qiyang (second from the right) -currently on secondment-, and Joe Diamond (not on the photo). SKA brand is more and more visible as the project grows and gains momentum, which is of course excellent news. All the efforts undertaken to standardise the brand across the partnership have been successful. 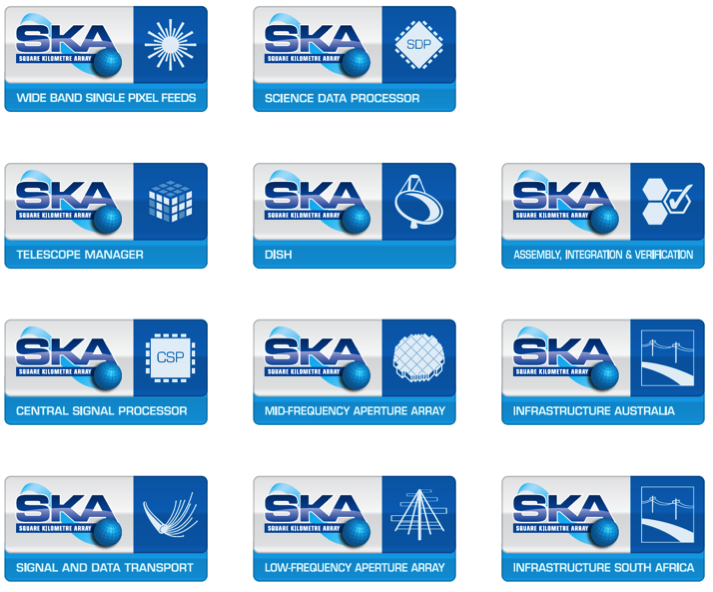 All of the partners in the SKA project have been using the same messaging to talk about the SKA project, and have adopted the international SKA logo. Having a strong, coherent and immediately recognisable identity is a key element for any major company/organisation, both in terms of the messaging and the visual representation. A brand guidelines document providing usage guidance and boundaries is available upon request for partners who wish to use SKA branding in their communication. For those of our readers who follow up closely, you will have noticed that a number of flags have been displayed on the top of the SKA website for some time now. These flags give a good sense of the scale of the SKA, as they represent not only the SKA Member countries (left hand side) but also the aspiring countries (right hand side), that is those countries which already participate in the global SKA effort one way or the other (science, design work, policy, communications, etc.) and which will hopefully become Member in the near- or mid-term future. Each flag links to the corresponding mini-site of the country, providing more detailed information about the on-going activities locally, and translated into the local language (where applicable). We’ll report on the production of new or updated material as it becomes available either through this publication or on the SKAO monthly bulletin (in addition to regular mentions on SKA social media). One of the key initiatives of the SKAO Comms team is to ensure a strong and continuous presence (talks, stands, provision of material) at relevant science, engineering, policy, and science communication conferences worldwide –including national astronomy meetings. This provides an excellent opportunity to update the audience on the latest news in the project, to expand our network and increase the SKA profile and visibility, and to interact further with our community. Main conferences we target include: IAU GA, European Week of Astronomy and Space Science (EWASS), American Astronomy Society (AAS) conference, Euroscience Open Forum (ESOF), AAAS meeting, SPIE meeting, URSI conferences, Communicating Astronomy with the Public (CAP) conference, International Conference on Research Infrastructures (ICRI) conference, etc. Of course, we are happy to consider providing support to more technical symposiums attended by our partners as well and we strongly encourage you to get in touch with us might you plan to be involved in such activity. We’ll be happy to team up with you in organising a joint presence and are happy to provide supporting material. 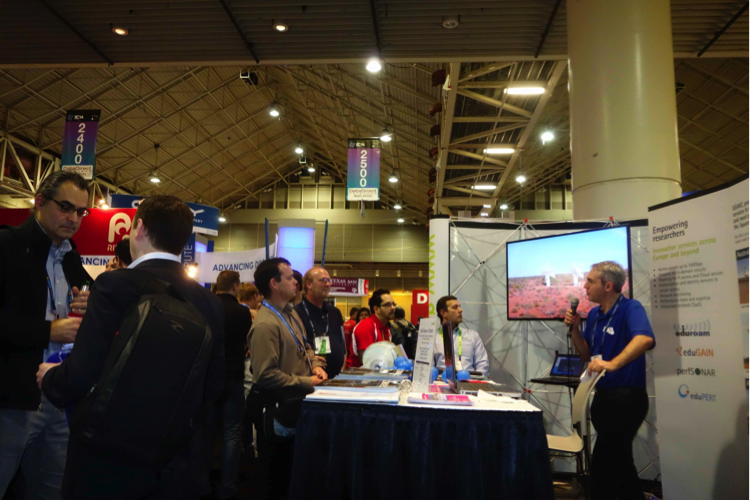 Joint GEANT/SKA stand at SC2014 conference in New Orleans, a conference for high performance computing, networking, storage and analysis delegates attended by over 10,000 people. The art/astronomy ‘Shared Sky’ exhibition coordinated by the SKA Organisation in collaboration with Australian and South African partners is a unique outreach initiative. Inaugurated in Perth in September 2014 as part of the SKA engineering meeting, it was exhibited at the John Curtin Gallery several weeks before heading to South Africa, where it was displayed in the Iziko National Art Gallery for more than 3 months. In both locations, the exhibition hosted thousands of visitors and the feedback received was absolutely amazing. Shared Sky’s next step is the UK and the SKA HQ, where it will be exhibited for a month starting at the end of July, in collaboration with Jodrell Bank Discovery Centre. This exhibition aims to be a celebration of humanity’s most ancient cultural wisdom, alongside one of the world’s greatest scientific and engineering endeavours. 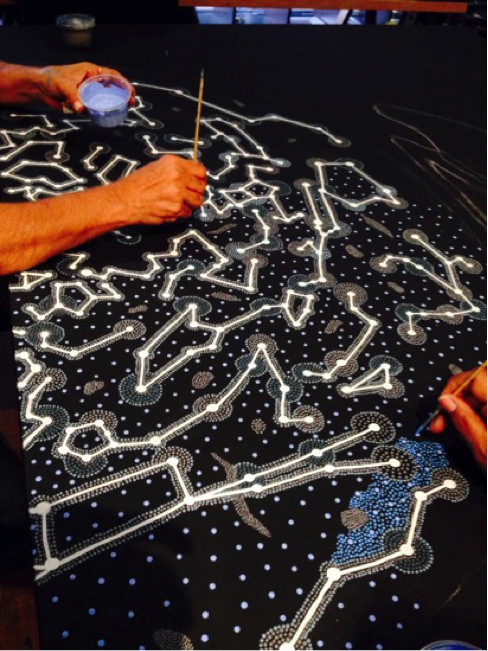 South African artists, descendants of ancient cultures that lived for thousands of generations in the landscape that cradled the origin of our species, join Australian Aboriginal artists, descendants of one of the oldest surviving cultures on earth beneath a Shared Sky. 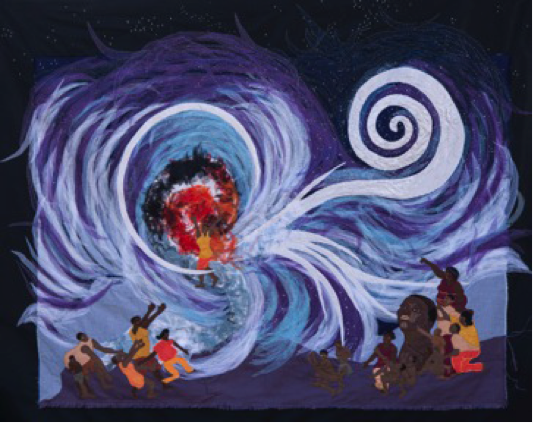 Large tapestry from the Bethesda Arts Centre First People Quilters, exploring the moon, the Milky Way and the sun, accompanied by translated stories. Addressing the issue of gender equality in STEM (science, technology, engineering and maths) is something we as SKAO Comms team take seriously. It is a challenging enterprise, as unfortunately, there is a lack of female representation, especially in the engineering field worldwide. A lot of work needs to be done, in particular targeting younger audiences and showing them how thrilling it is to pursue studies in STEM, with exciting career opportunities in fantastic projects such as the SKA. We’ve been developing a number of initiatives towards this, making our small contribution to this global issue. For example, we encourage our female colleagues to take part in public speaking activities to be positive role models for young girls. Recently, they were involved in a Girls Night Out event at Jodrell Bank which proved extremely popular (more in the upcoming SKAO Monthly bulletin). We are also working to develop profiles of our female colleagues from across the SKA partnership on the SKA website. Stay tuned! 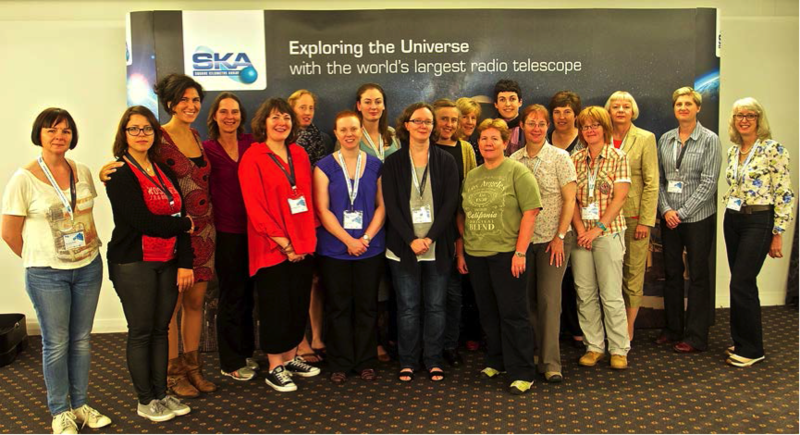 Group photo of our female colleagues who participating in the SKA engineering meeting in Fremantle, Western Australia, in October 2014.